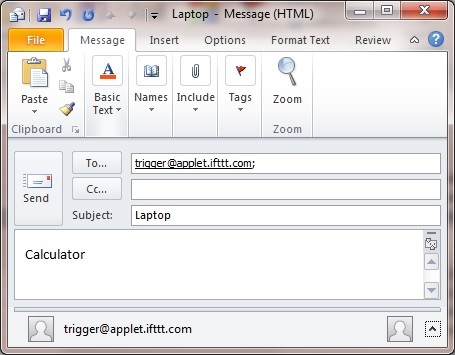 The example below lets you email trigger@applet.ifttt.com from your IFTTT account's email address to trigger commands. The email needs the computer name in the subject, and the trigger name in the body of the email. Click the "+ this" link. Type "email" and click Email. Click Send IFTTT any email. Click the "+ that" link. Type "webhooks" and click Webhooks. Click "Make a web request". Change Content Type to "application/x-www-form-urlencoded". You can use the same concept to trigger commands with other IFTTT services (instead of Email) too of course. I recommend you don't open your garage with a post on facebook. See this article for how to pass parameters to your commands. You basically need to add another POST parameter called 'params' that contains your command parameters. You can put params in your URL with &params=russ.txt, or you can add &params=russ.txt to your IFTTT Body field. This opens up a lot of possibilities. I just setup an IFTTT trigger to display on my PC any pictures I add to a Google Photos album. I think you've got Subject and Body reversed because the computer name is in the subject. @trigFox , thank you for pointing that out! I fixed it. Now the screenshot matches the web request URL. @dfwjr1973, you're close, but you're missing the computer part of the URL. Thank you. Let me know your results please. Yep...it works. Thanks for the help! This works great when I create a normal IFTTT. I'm having trouble making it work when the IFTTT is created on the platform for private apps with a maker account. with this, you can make multiple steps or "that's" (think IFTTTTTTTTTT). Even if I just create one "that" in the private app, I get an "action failed" on the webhook with triggercmd.. "unable to make web request. Your server returned a 401"
any ideas or is this an issue with IFTTT? @delkem, I'll give it a try. It should work the same way. One problem I've had before was I had a space in the body field that I didn't notice. That could cause that error.